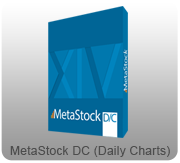 Improve upon the advanced analysis power of MetaStock by adding on MetaStock's incredible Add-Ons which provide additional functionality to MetaStock. Add-ons can include the creator's trading methodology by adding custom indicators, explorations, system tests, and expert advisors. The Volume Reversal serves to identify and validate a particular type of reversal environment, where a shift in market control from buyers to sellers or sellers to buyers occurs, resulting in a change in market direction. Annual Subscription. Take advantage of Martin Pring's time-tested method for identifying emerging sectors in the market cycle. MetaSwing is a comprehensive trading system which utilizes volatility-based technical analysis. Annual Subscription product. Nison's Candlesticks Unleashed generates reliable trading signals with an ingenious trading system based on Steve Nison's favorite candlestick signals and is equipped with tools to determine market forecast (bearish/bullish), risk/reward ratios and more! Performance Systems Plus comes with 54 new performance systems and 70 explorations will have you trading with a higher level of confidence than ever before. These systems have a highly successful track record over an entire database of securities. Power Pivots Plus allows you to pinpoint the best time to get in a trade. It uses proprietary algorithms to evaluate the market's current trend and momentum, to help you identify, label and act upon those key pivotal support and resistance levels. PowerStrike Offered by Equis International is the latest offering by John Slauson, the creator of ICE™ and FIRE™. MetaStock.ca is maintained by FundSoft, an authorized partner of MetaStock. Email us at info@metastock.ca All Registered Trademarks on this site are the property of the respective owners. Copyright 2019 FundSoft http://www.FundSoft.com All prices are in USD.